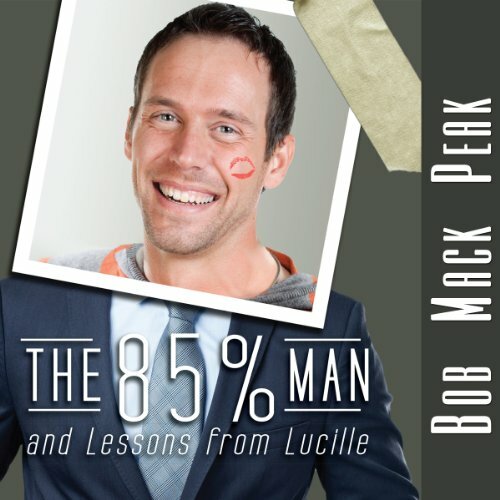 The 85% Man and Lessons from Lucille is Bob Mack Peak’s well-crafted, uplifting, heart-felt romantic epic—a lighthearted look at differences between men and women. Peak validates the open proposition "Everything my mother told me about women is true... and I can prove it." The book’s flowing narrative offers the reader a delightful journey toward discovering life's truest reward—unconditional love. The 85% Man and Lessons from Lucille finds a parallel and rampart through the life of the author’s parents, a part of The Greatest Generation. Raised during the hardships of the Great Depression, they built a terrific life with beloved children, yet suffered terrible losses toward the end of their lives. Readers who adore the films Terms of Endearment or The Help, will fall in love with Peak’s book. Peak offers guidelines rather than rules to help women, men, and couples to “Love Long and Prosper.” The 85% Man is uniquely different from similar books of the relationship, self-help and romantic genres written by a plethora of PhD’s and various authors. Peak draws upon personalized experiences supported by the timeless, sage advice of the author’s mother, Lucille. This book will help readers achieve a useful perspective on what’s genuine in life and love. Displaying his gift for honestly communicating deeply moving experiences, Peak carefully navigates the ups and downs of his relationships. Peak relates his ex-wives to “experimental flights,” since his birthday coincides with Chuck Yeager breaking the sound barrier in the X-1 test plane on October 14th. The author’s “EXs” were not dissimilar to unstable test planes that often crash. Some of his “relationship crashes” left no survivors, while others smashups provided the genesis of a phoenix-like rebirth. Perhaps best of all, the book references a link to the website www.85PercentMan.com featuring a section where visitors can calculate how their man scores, and discover WWLS (What Would Lucille Say). What made the experience of listening to The 85% Man and Lessons from Lucille the most enjoyable? I've read numerous books about relationships and at some point I stopped relating to the couples or author's advice. This book is less advice and more of a true story that really resonated with me. Lucille... she sounds like she was happy, loving, smart, sensible and really loved her family. Her advice is very wise and I would have loved to have been at their dinner table. Loved the scene when he went fishing with his grandpa and dad. I can totally see it take place by the way it's told and just really laughed while hearing about the snake in the boat. As a divorcee that has kissed my share of frogs, it's refreshing to read something I completely identified with. While wanting to be a part of Lucille's family, I was fully engaged in the self-discovery journey of the author through his several marriages, endless online dating and some pretty funny predicaments. AWESOME STORY! GREAT FOR MEN AND WOMEN. This is a very personalized story like I was sharing a best friend's journey. The narrator did a great job of capturing all the characters, fun and disasters in the story. It made me laugh out loud, cry and think deeply. It made me wish I was part of the family with Lucille and Pops and the whole clan. The author's personal journey was really engaging as it paralleled his search for a relationship like his parents had. It spans several decades and it tugged at my heart. Have you listened to any of Mike Chadwick’s other performances before? How does this one compare? Yes, this is probably my favorite. YES. The open setup of being a character in a scary movie venturing down dark stairs into the basement with my mother in the audience yelling "don't go down there" got me hooked. Each chapter has a Lesson from Lucille that made me want to discover more. This is a must have guide for every man to understand women and get the most out of any relationship. I wished this book was available 15 years ago, it would have kept me from doing some dumb and really dumber stuff with my wife. The unique flow mixes the author’s quest for unconditional love paralleled with his parents incredible life. I read Men are From Mars and this is similar (much better for MEN and women), but there are really two stories. One is the author’s journey to find a great woman (85% Woman? ), and the other is a story much like the movie Parenthood that really makes you want to a part of Lucille’s joyous family. LMAO in many chapters, while taking notes on how to improve my marriage, it’s a fascinating, unique voyage.